I am trying to make sure that my iweb widget is a secure submission. I clicked embed form, then clicked secure. It added the "s" to the http. I then clicked the iWeb button and copied and pasted into my widget. I have verified that it has the HTTPS. I did a test and my jotform submssions is saying I havent used any secure submissions, only the unsecure. Any suggestions. It needs to be secure due to CC info. Does my website need to be HTTPS too? As long as you have used secure iframe codes for embedding the form into the iWeb Widget, the form shall remain secure. I inspected your website and the page that contains the form. You have embedded the form using Source, which should not be the case because embedding using source code will integrate the form in to your website, which has an unsecure connection. 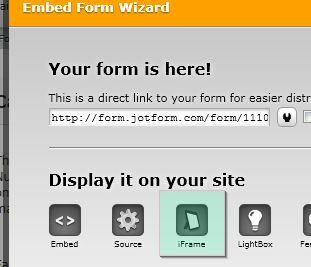 To solve this, you must use iframe codes to embed your form. Let me know how this solution works for you. Get back to us if you're still experiencing the same problem. Thank you. Hello, Neil, thanks for the quick reply. I used iFrame with the secure button clicked. Then I copied the source into the iweb widget and tried again. I still is not sending it as secure. Any other suggestions. Also, can 2 seperate email account be notified when a form is filled out? We hope you find this information useful. Please let us know if we can be of further assistance. Hello, I did have that in code in my iweb widget. I copied your coded in it anyways. I filled out the form and it is still going in unsecured forms. Any other thoughts? It should work, but for some reason it is not. My website isn't secure. I am understanding that with the iFrame the form is independent from the site and should be secure. Thanks for the update. If that's the case, I shall escalate your concern over to our Tier 2 Support for further troubleshooting and investigation. You will hear from us again once updates about this ssue become available. We apologize for the inconvenience. Hello Olivadi. We apologize for not being able to get back to you on this right away. I'm not certain if any of the development team was able to look at this and have it fixed. And since the page is no longer existing on your website, I'm not sure whether everything works out properly. However, if there are further concerns or other issues that needed to be resolved on your end, please do let us know. We'd like to know more and have it fixed.